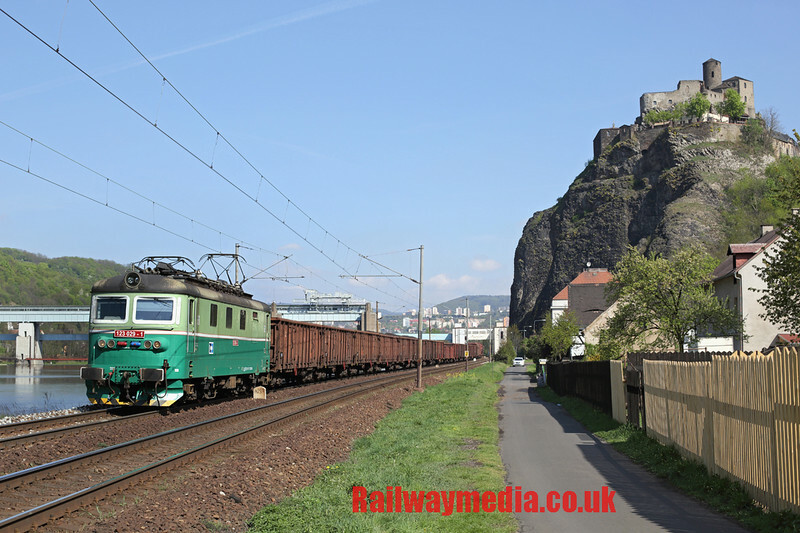 A warm welcome as always to the Railwaymedia blog, edition 67 which will cover last weeks trip to the Czech Republic, principally to Ústí nad Labem in the north of the country. It was a trip organised by a friend so for once I was really just tagging along, he had sorted out the best photo locations in the area and the times of day the sun, if any, would be optimum for getting those shots. All in all it turned out to be a very succesful trip and probably one of the most enjoyable foreign jaunts I've been on to date with plenty of freight and loco-hauled passengers seen. Outbound we went on a mid-morning flight from Stansted. This put us into Prague at about half past two local time so once the hire car was sourced we were straight out. Unbeknown to me there is a diesel line not very far from the airport, it would be pretty easy to create a spur to the terminal itself, but I guess the cost of upgrading this single track route to carry airport services would be high (though not as high as extending the metro or tramlines). 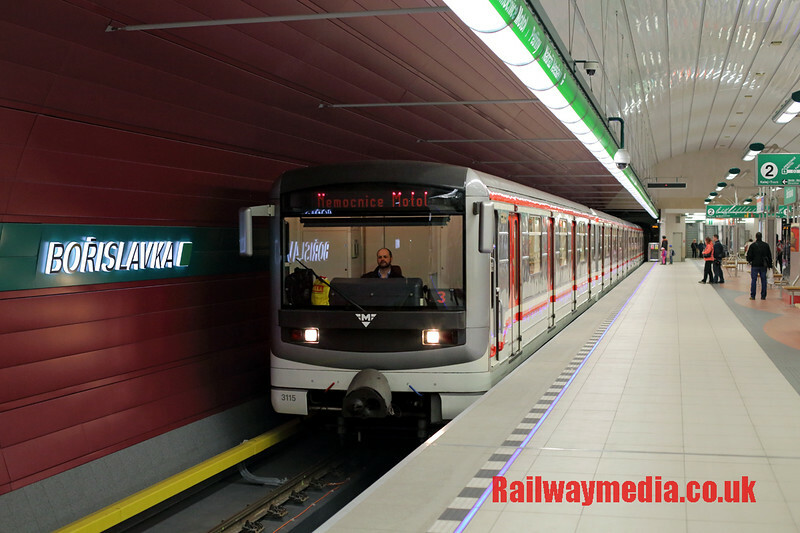 Current options for getting to and from the Airport and Prague itself is a half-hourly shuttle bus direct to the main station or a frequent local bus to one of the two nearest underground stations for the Metro onwards. Anyway, as we had a car this wasn't an issue right then so we drove the 15 minutes round to Hostivice located pretty much at the end of one of the runways. A small town, the station is a major passing place on this single-track route. The first picture of the holiday was of a pair of rebuilt 'Goggles' working for private operator SD Kolejová doprava which were shunting onto a rake of wagons in the yard. 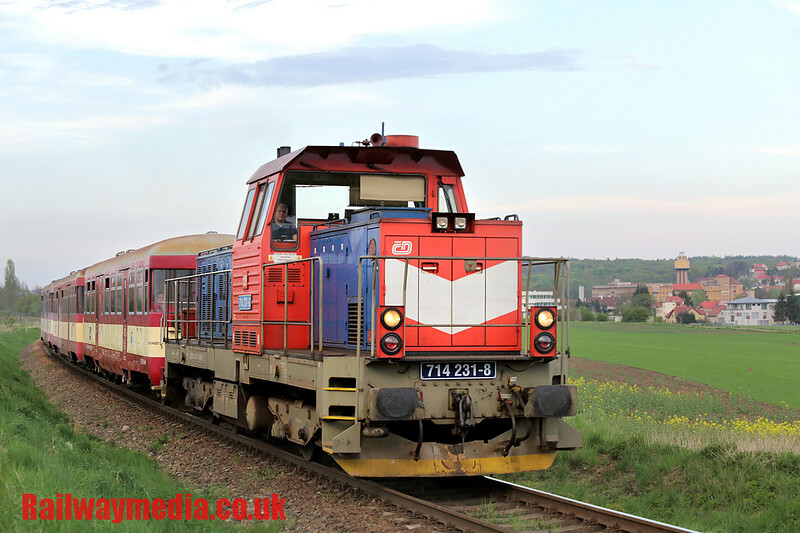 'Goggles' is the nickname for a common Czech and Slovak diesel locos from classes 750, 753 and 754 so named because of their distinctive cab windows. The main reason we went to Hostivice was because one of these was due on the 1502 Prague to Rakovnik passenger train. There is a frequent local service on this route usually provided by rebuilt and unrebuilt class 810 and 814 railbuses but in addition there is this loco hauled train every couple of hours. 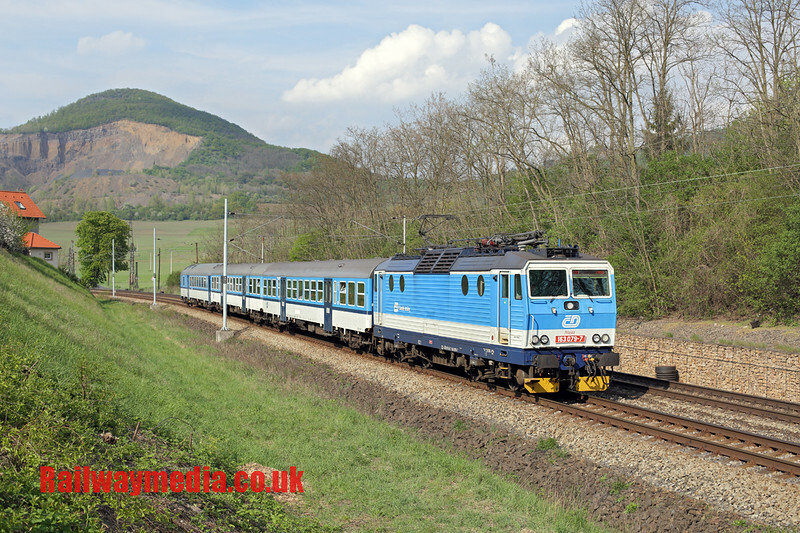 The next location we visited was about 30 minutes down the motorway past Beroun at the very similarly named Hořovice located on the Prague to Plzeň mainline. This was a busy road bridge but with a pleasant view across the fields. 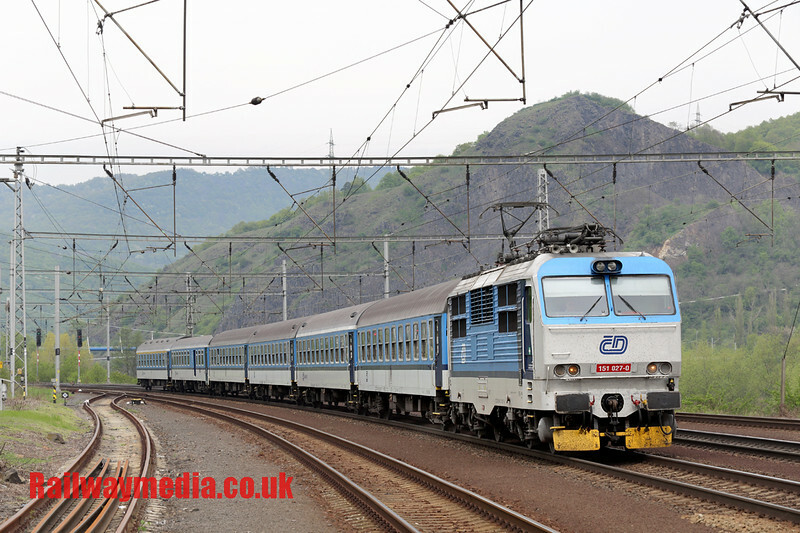 We had about an hour there in which we saw four loco hauled passenger trains plus a Czech Pendolino. There appears to be little freight on this route despite the fact that beyond Plzeň (Pilsen, home of the famous beer type) the line extends into Germany. After the hour here it was back finally to near the first location to Ruzyně for the passing of two diesel hauled passengers on that route, the second being the next run-by of the 'Goggle' we had photographed earlier but the first a peak hour diagram with a smaller class 714 engine hauling a rake of what I call 'Wheelie Bins', which are basically glorified tin cans on four wheels. There was a fairly long drive then as it started to get dark north to our base for the rest of the week at the Hotel Vetruse in Ústí nad Labem. Ústí is a large town on the River Labe (known better perhaps as the Elbe), 'nad Labem' literally meaning 'above Labe', and is appendaged after virtually every town name along it. The hotel itself is highly recommended. Four star it is spotlessly clean and whilst probably expensive at Czech prices very reasonable to us at about £45 per night. Rather than list what we did over each of the next three days it will probably be easier to describe where we went in terms of the railway routes along each side of the river. The line through Ústí is the main route between Dresden in Germany and Prague. In Germany it is a single route along the west bank of the river but when it reaches Děčín it divides and there is then two routes, one along each side. 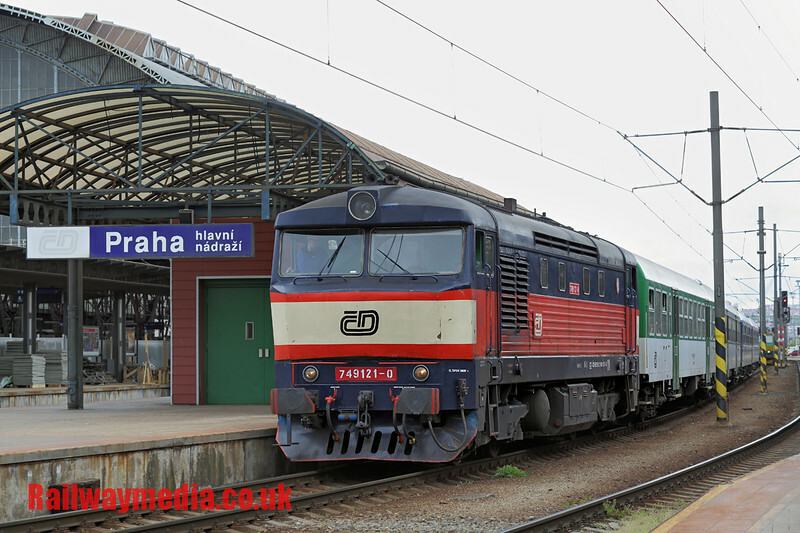 In generally trains bound for the Prague area must travel along the west bank and trains heading towards Kolín and the east have to take the other bank south of Děčín. It is possible for them to go along the west side as far as Ústí but they then have to enter the yard there and run round. 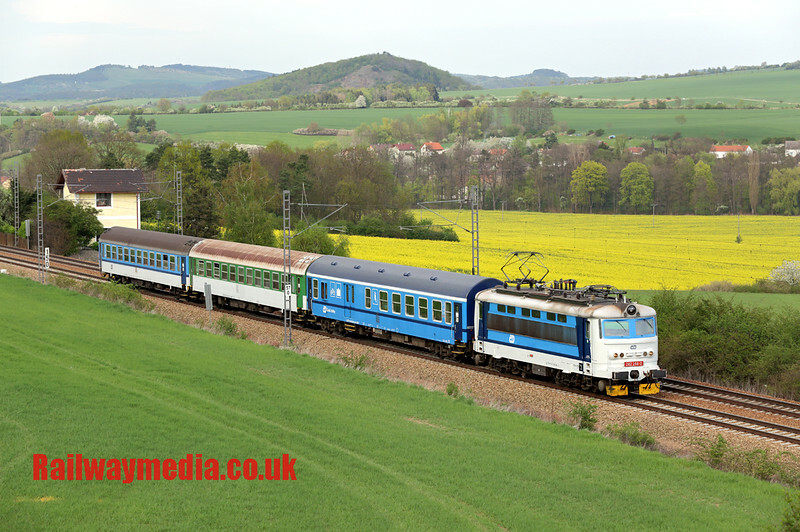 So I shall start the main bit of this blog about the Czech Republic with a picture of a local German train. After a hot partly sunny first half day in the country with temperatures exceeding 20 degrees the next day was 3 degrees with rain and even a heavy snow for several hours! 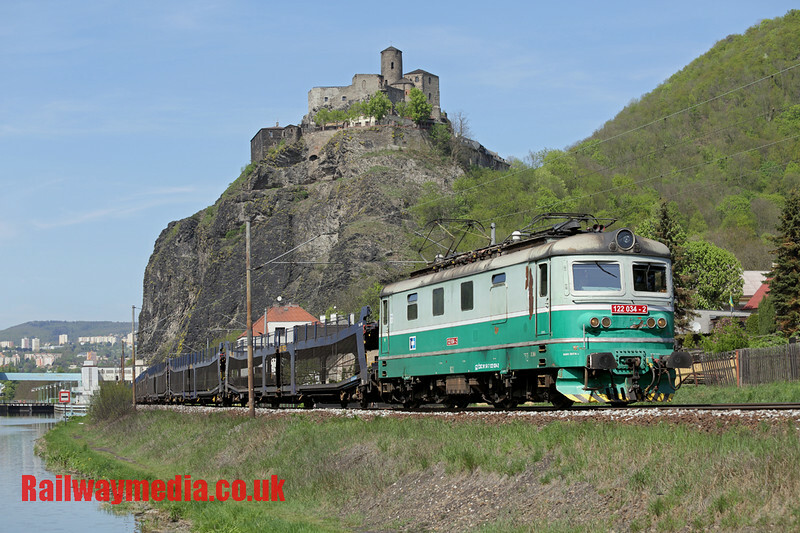 With there being no possibility of any master scenic shots along the river near Ústí given the weather we decided to head over the border to the section of line near Königstein on the German banks of the river. My last visit here was during my first foreign jaunt in 2006 when the half-hourly Dresden based S-bahn was entirely in the hands of former East German class 143 locos. Most now are pulled by new Taurus engines but it was nice to see a couple still with more classic traction. We spent a good part of the day at Kurort Rathen where there are several vantage points; with the S-bahn stopping here it is very doable by public tranport. This shot, and many others, was taken at the level crossing to the south of the village, there is also a shot available to the north of the station but the southern crossing offers views either way, plus a bit of warning from the bell on the barriers, and more importantly on this day, some shelter in the form of a wooden public gazebo next to it. We returned here later in the day too as the others could watch the trains from the warmth of the car whilst I got wet and cold rushing about photographing the regular passenger and freight trains. In between we retreated from the rain by having coffee and dinner in a nice little cafe in Königstein before trying another shot which promised to be a good location (if the sun was out) near Krippen station. The long straight provided a bit of warning of oncoming trains, although the view of their approach was somewhat marred by the lack of visibilty caused by the weather. For completion of the area, Königstein itself can be good for pictures too, a popular place in summer months with a small ferry across the river. Photos from my previous trip can be found HERE. Between Děčín and Ústí we only tried one location, that being on the east bank at Techlovice. We had heard that the east bank was generally busier for freight, in practice we found not much between the two. The west bank has more, and more variety, of passenger services but south of Ústí freight levels seemed pretty consistent on both sides with generally two or three each way an hour (though with the occasional longer gap). 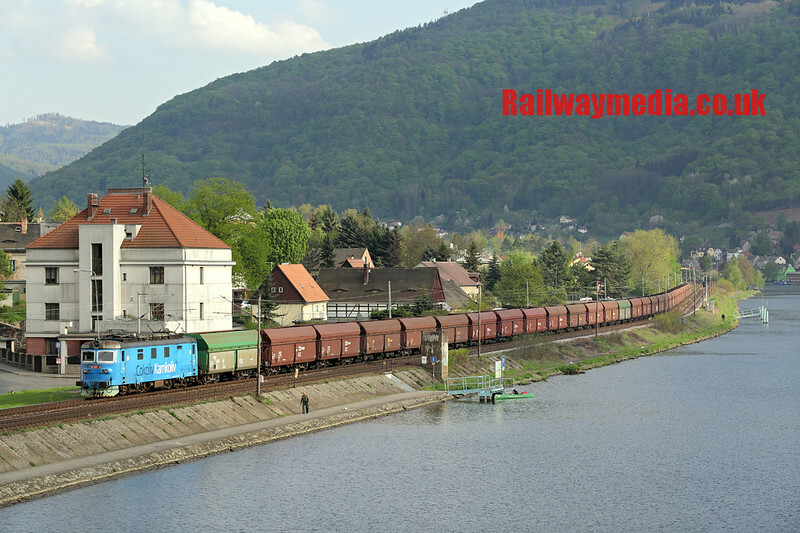 North of Ústí is a bit quieter on the east bank as there are additional trains coming out of the yards at Ústí, however Techlovice was a nice location with views from the lane and the field and we did get three freight trains in the hour we were there. As can be seen from the above picture, the following day was again a massive contrast in terms of weather and we had unbroken sunshine virtually all day enabling us to tour all the locations we had wanted to visit. Staying on the east bank of the river, but heading from the south, our first port of call that day was Litomerice where there is a nice early morning view from the road bridge across the river with the attractive town as a backdrop. The bridge was being reconstructed when we visited but apart from a bit of rubble in the foreground it didn't detract from the shot. Unfortunately only one freight train came the required way whilst we were there (as usual three went the other way). Fortunately the hourly passenger service on this section of line is loco hauled, usually in push-pull mode with the engine on the south end, which gives a bit of added interest whilst waiting. A location we didn't visit that particular day but we found the next was two villages down the river at Libochovany. We actually spotted it as a possible photo opportunity from the station at Prackovice on the opposite bank, about 3/4 mile away as the crow flies but about 40 minutes by road. There is a road and cycle path flanking the railway to the north of the village, in investigating the latter we found a nice spot in a small grass lined cutting where the light was right for most of the afternoon. We were a bit unlucky with the sun that day but did get one passenger shot in nice light. On our way back from Litomerice on the morning of the second full day we stopped off for 15 minutes at Brná nad Labem south of Ústí where there is an excellent morning shot good for southbound trains from about 0930 at this time of year until about 1100. 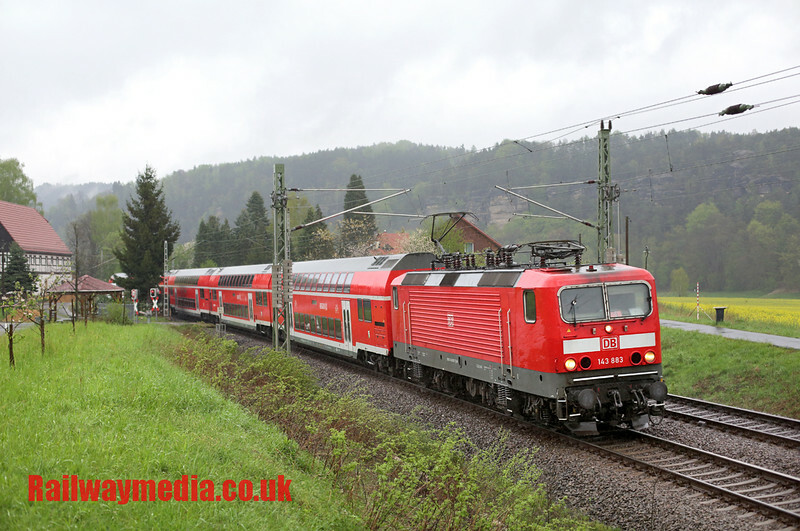 We were rewarded by two freight and a passenger train within 10 minutes, we noticed that the freight trains often seem to be clustered around the time the passenger service is due. I wasn't keen on the steep bank we had to climb as it was still very wet from the previous days' downpours but it was well worth the effort. There are no stations nearby but there are frequent buses on routes 17 and 27 from Ústí. I will actually leave the main location on this line for last, partly as it does sort of span the river, so with that logic I will move to the west bank. We only visited two locations on the line running towards Prague; in general the east bank is much quiter in terms of road traffic and built up areas and is also less enclosed by trees. I spent an hour at Prackovice station whilst the others went in search of somewhere better. 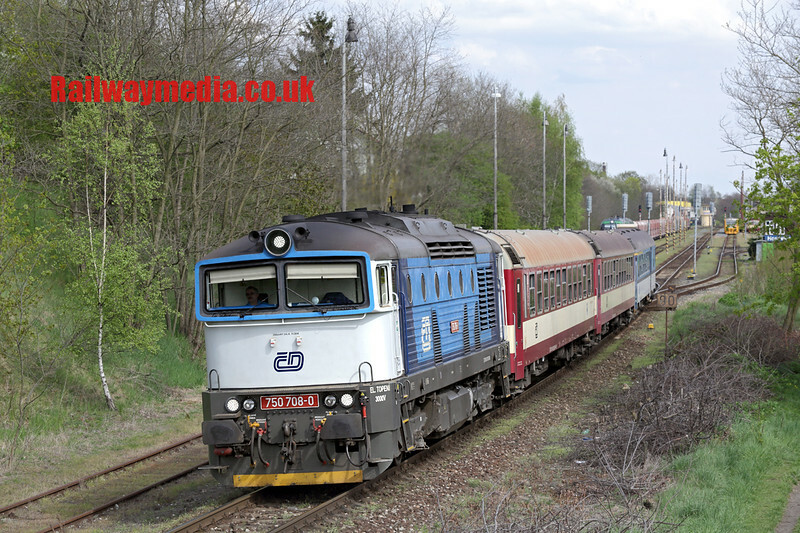 There are loops here which I guess are probably well used by freight; the local hourly passenger service operated by Ceske Drahy's only double deck stock, Prague based three car electric units called 'City Elefant', use the loop heading south to serve the platform. The view off the end of the platform wasn't at all unpleasant, the sun was trying to come through but failing and at 1330 when this picture was taken was just starting to be good for southbound shots. Moving north the other location we tried was at Vanov. Again there is no station here but bus number 15 runs roughly hourly. The main shot is in an afternoon one of northbound trains taken from a minor road parallel to the line as it passes a small attractive chapel. There are morning shots of southbound trains available but they are on the nearest line so the banking makes them less than ideal. If anything the west bank line sees more activity by private operators than the east where elderly CD classes 122 and 123 dominate on freight. 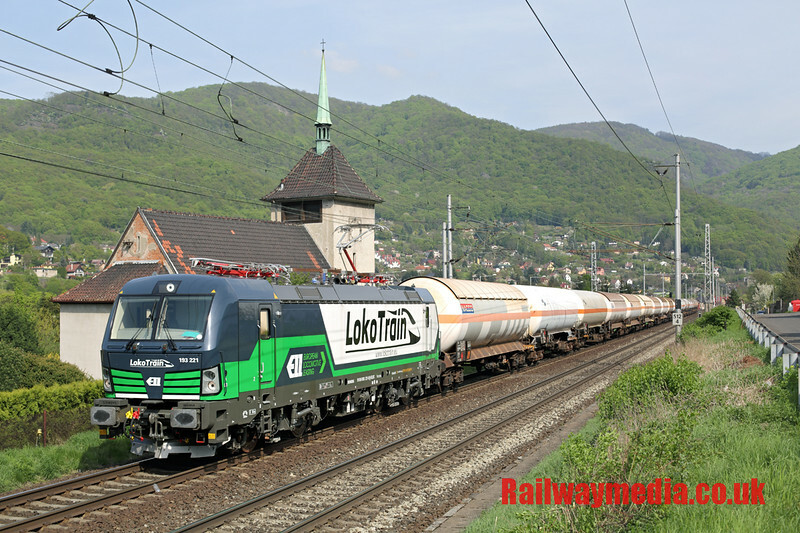 I like the new Siemens Vectron and this livery suits it well. Having described all the places we visited outside Ústí there just remains to mention the main one at Střekov, a suberb location to the south of the town. You could spend virtually all day from sunrise to sunset at this particular spot as it offers numerous views of the east bank line. There is a railway station at Strekov which is about a 15 minute walk from the weir, dam and locks that forms the centrepiece of this part of the river. It would be also possible to walk along the river from Ústí itself or there are three bus routes running regularly, the 9, 17 and 27. As mentioned there is a gigantic lock complex stradling the River Labe, one of several along the river large enough to take massive leisure boats and industrial barges. There is a footbridge across this enabling shots looking over the water, indeed you can get across to the west bank and also get nice images looking right across to the castle that dominates that side of the river. From the early morning shot pictured below to the afternoon shot taken from a small metal jetty in the river itself (above and at the top of the blog) to views from the dam itself (very last picture at the bottom) there is a wide range of views available. Apart from the few pictures I have added here the rest of the shots I took over the course of the week in this location can be searched HERE. A couple of other things I should add about this spot, first being there is a small car park by the line just as the road bends away from the railway which is useful but also there is a convenience store about 100 yards up this road which would live up to its title should you wish to spend all day here. The signals looking north before the dam give you good warning of approaching trains in that direction but the southbound signal is automatic so no help regarding what is coming. Having had three and a half excellent days photographing, Friday was the day to head home. We had all decided to go our seperate ways back, my flight back to Manchester was just before teatime so I caught the train back to Prague for a few hours photographing the trams and trains in the city. I was lucky enough to see a class 749 diesel on a working to Čerčany, these were endangered on my last visit so good to see one or two are still holding out covering for unavailable 'Goggles'. They sound a bit like a British Rail class 25 or 33 so have long been a favourite with British enthusiasts. A quick visit to the nearby Marasykovo terminal station also produced a shot of a 'Goggle' waiting its next duty to Rakovnik, plus a few pictures of trams were taken in the vicinity. All in all, as I have said previously, this was an excellent trip and one which makes me want to return to the Czech Republic again. Lots of freight trains were seen and although the weather was a bit hit and miss we did well and got to all the locations we wanted. Many thanks to our Chauffeur for both doing the homework on the best places to visit and of course for doing all the driving. I'll leave you with the promised view taken from the top of the Střekov lock. Thanks for taking the time to read all this, I hope it will be of use to anyone wanting to visit the Ústí nad Labem area, hopefully all the links in the place names should take you on Google Maps to the rough spots the pictures were taken from enabling you to find them easily. Please keep a look out for the next edition of the blog, providing I get to go anywhere in the next few weeks, bye for now!